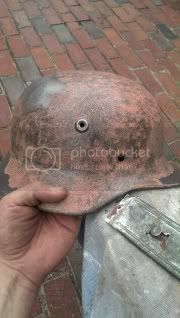 wwii axis reenactment forum • View topic - Quist M40 Size 66 or 68,part stripped,interesting colours. Post subject: Quist M40 Size 66 or 68,part stripped,interesting colours. Recently got a complete M40 helmet,airsofter or reenactor special-original Quist M40 Shell in a size 66 or 68(cannot quite make out the last number). Outer looks to have been recently painted in a very dark grey-almost black(interior looks to be original greenish paint? )and fitted with a post war liner and post war chinstrap. Didnt like the colour so decided to very sparingly apply some Nitromors type paint remover to a few places just out of curiosity to have a look whats underneath and some parts seem to have been stripped down to bare metal,others still have layers of original paint-grey/green,white and desert tan and also there appears to be a minute trace of an original decal so have now stopped and dont know what to do????? Will post some pics up if I can get some decent ones of the colours as my camera isnt the best. I'm no expert,but a winter coat,along with a desert coat sounds strange,not doubting it's an original Quist,but are you sure the paints are original,or did the reenactor portray a few diffrent fronts/campaigns? 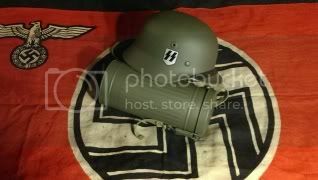 No idea in all honesty if they were applied in the last year or the last 50 years as the helmet could well have been re issued post war by any number of countries and then also used by re enactors/airsofters. Not sure what to do myself in all honesty,bought to restore as I should have an original liner somewhere and have just bought a new set of repro split pins. Maybey have it appraised? I know the shell is worth money,but with the paint so badly beat up,and the baremetal scuff marks,I doubt the original paint would add much worth to it. I know original paint generally lends more worth to an item,Bit in that condition im unsure. A collector would know..it you cant find an answer Here,the Wehrmacht Awards Forum has a section for helemet collectors. If I can find the original liner I have and its the right size will strip it down to bare metal an re do,if not will remove that crappy liner and try to sell the shell as it is. I used a razor for the heavy stuff on mine(Watch your fingers!) And used 150 grit sand paper on a mouse sander for the rest. Worked well,and leaves minimal buff marks,dosent remove a noticeable amount of metal. While sanding it was just dust. My helmet is an M40/55 Finnish contract. For the decal,I found the glue is awful. One second too long in the water and the glue is useless. So I painted the outline of the shield on the helmet and stuck it down that way, you can use a hairdryer on high to quicken the process just be aware of dust! Then varnished over the decal and it worked amazing. 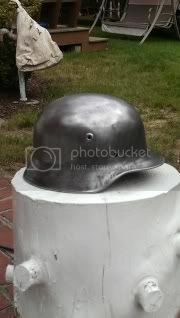 Next helmet I do I will use this same method.